The story is nice and very tightly woven. It has all the ingredients of a good novel - Suspense, mystery, love, hatred, thrill, revenge, pain and strong and real characters. As the story unfolds, the book draws you into its pages and you begin the roller-coaster ride with the characters. The emotions the characters, Nishant, Nidhi, Payal, Rujuta and Prakash display makes you identify with them in many ways. The language is simple to understand and the little details that talk about Mumbai; the food there, the culture and the life in Bollywood makes the book interesting even to people who have never visited the city. The way the author has included some bold scenes and woven them well into the novel makes you realize that he is good at his work! Well! As you can see I liked most of the things about the book; of course there are a few things that did not work for me. One thing is that the first chapter dragged on as there were too many details involved. Another thing that caught me unawares was the first murder, yes, the detailing was good, but for a sensitive person like me, it was way too much. The scene where one of the characters was so brutally treated and no one came to her aid was something that was hard for me to believe! 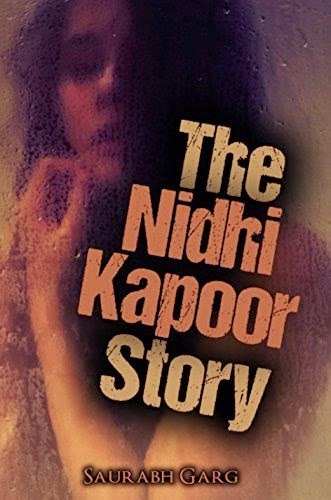 All in all, The Nidhi Kapoor Story is a good read. As a reviewer, I would say that Saurabh Garg is here to stay and create a name for himself in the writing world. As a fellow writer, I wish him all the best for his future endeavors! I wanna grab the book and ur detailed review makes it an awesome read..suspense and tight narrative. Vishal, thanks for always taking time out to read my posts! The book is indeed good..maybe u can add it to the list of books you want to add to your collection!